My father was a journalist. So was I (briefly). That means I’m conscious of headlines, the good, the absurd and the comical. Years ago, the New York Times ran a weekly piece for its staff called “Winners and Sinners” in which it commented on the stories and headlines that hit gold and those that hit fool’s gold. It was enjoyable reading for me and a learning experience. My favorite headline of the past comes from Variety. It’s been copied and referred to so many times, that a fair number of places of the web explain what it means. This one appeared in July 1935 over an article claiming rural audiences didn’t care for movies about rural life. A lot of people think this headline was STIX NIX HIX PIX. That would have been funnier, but in four words, the editors still said it all. On November 3, 1948, the one-star edition (which means that it was an early one of many for that day) called the Presidential election a bit early based on its polling. The fact that the paper and the candidate both had low opinions of each other might have played into the error. 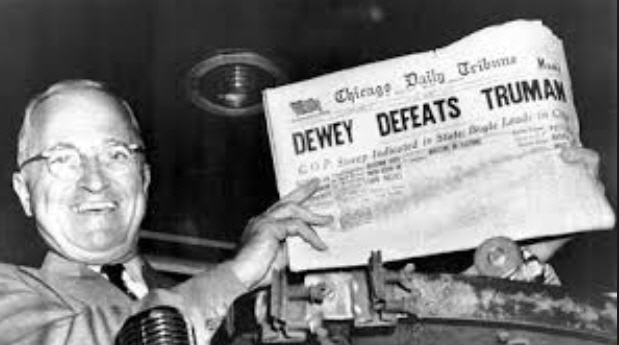 The photograph of Truman holding up the paper has probably become more famous than the headline itself. 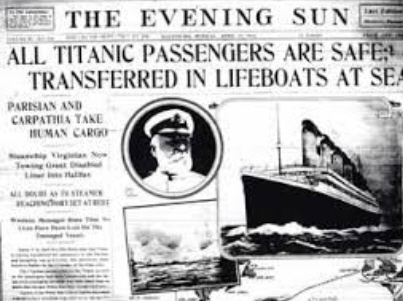 In April of 1912, the New York Times reported that the Titanic sank, much to the dismay of other papers who were relying on wishful thinking and White Star Line assurances. The fact that one paper reported everyone was safe seems to have occurred when Marconigrams were intercepted and mixed up by amateurs. One of the wires that apparently helped create the confusion was the one that asked ARE TITANIC PASSENGERS SAFE? Somebody read the question as a fact. This gaffe, however, remained one of the largest until the Dewey Defeats Truman headline. 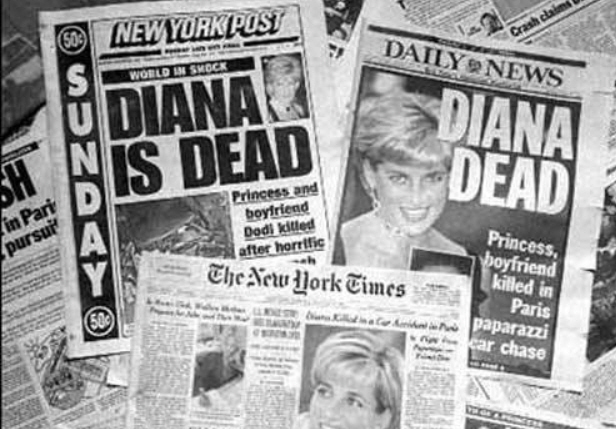 The stark, sobering headlines about Princess Diana’s death in August 1997 contrasted so greatly with the love many felt for her, they immediately captured the grim event. The fact that she died in a car crash seemed to so many such a mundane and tragic fluke, leading to conspiracy theories, that her last moments stayed in the news seemingly forever. Here’s a headline that definitely would have found its way into the New York Times list of sinners. 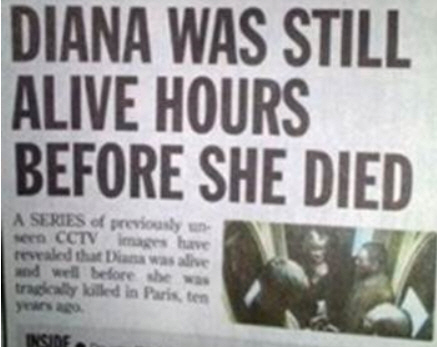 Headlines are often written quickly, leading to inadvertent meanings the editors don’t intend. Headlines like this frequently made their way into comedy bits on the Letterman and Leno shows. Today, Facebook, YouTube and other social media are quick to capitalize on similar mistakes for places that didn’t really want to become famous due to a humorous typo. In grade school, various little rhymes helped us remember how to spell the names of the states. 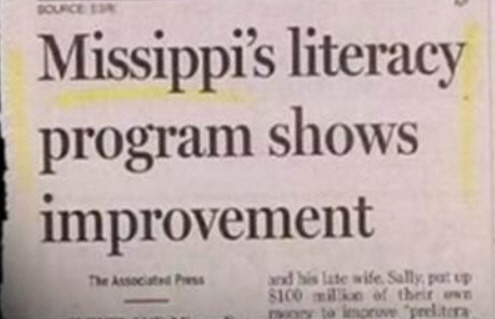 Mississippi was a problem state, spelling-wise, though it also was very easy to spell once you learn the little spelling ditty. Whoever wrote this headline was obviously out sick on the day of that lesson. These days, a quick Google search will turn up hundred of examples of church signs, advertisements, posters in store windows and road signs with hideous examples of misspelled words of words with double meanings. Yes, unfortunately some of these get into the newspapers. On the flip side, sometimes a satirical publication specializing in fake news stories helps capture the country’s mood about a major tragedy in a way that mainstream newspapers can’t so for sake of propriety. Here is, perhaps, the best such headline that came after 9/11. 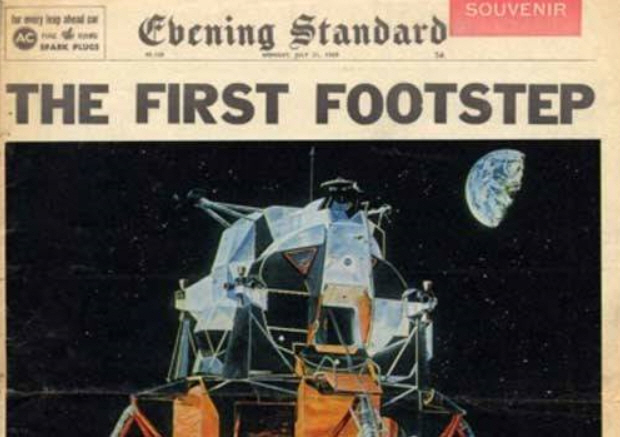 Editors are said to like gaining readers now only with sensational headlines (correctly written or skewed), but with puppies, babies, aw shucks moments and the minimalistic few words that say things just right as this paper did April 5th, 1968. In the “old days” headlines were more difficult to write because editors weren’t looking at them on the screen like they do today to make the they really fit in the space provided by the layouts. Each typeface had different spacing and checking to see what headline fit and what didn’t involved knowing which letters were thick, thin and normal. If you’ve been around for a long time in the business, then you’ll remember “flitj,” the list of thin letters, and you’ll also remember the “W” was a wide letter and took up more space. Now, the screen tells us what fits and what doesn’t. Yet, the year’s news still provides us with plenty of sinners to go along with the winners. I see winners and sinners every week. So do a lot of people. For better or worse, some of those seem to last forever, even ending up in memory lane posts like this one. I enjoyed some of the “sinners” from the past too. In today’s world, however, I see what I consider to be propaganda by the media using headlines that are actually opinions, conclusions that are not backed up by facts in the story actual story. Those who only see the headline get an entirely different picture of the event and that impression continues even after the “mistake” is acknowledged and corrected (it it ever is). I don’t like those opinion and loaded question headlines.